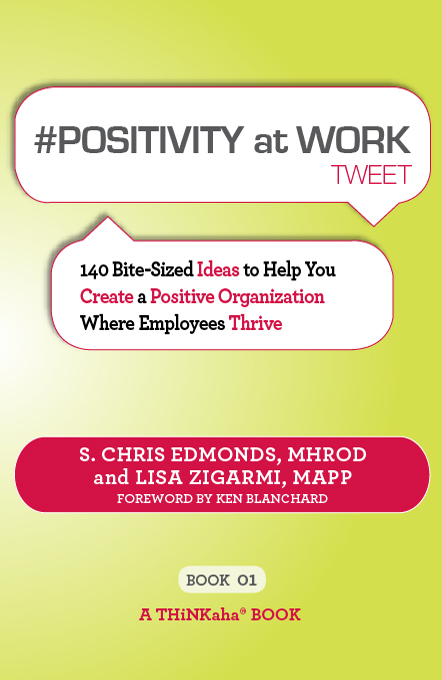 In their new book Positivity At Work, authors Chris Edmonds and Lisa Zigarmi identify five aspects of a positive work environment that lead to higher levels of well-being. That’s a hot topic these days as organizations deal with the general burnout prevalent in so many workplaces after three years of belt-tightening and a single-minded focus on productivity. Feeling a little burned out yourself? Here are five places to look for causes and improvement. See how you’re scoring in each of these key areas. Keep track on one hand. Raise a finger for every question you can answer “yes” to. Let’s start with the basics—“feelings.” The ten positive emotions are Appreciation, Love, Amusement, Joy, Hope, Gratitude, Serenity, Interest, Inspiration, and Awe. How many of these emotions have you experienced in the past week at work? Raise a finger if you’ve experienced at least one of these emotions during the past seven days. Good relationships may be the single most important source of life satisfaction and emotional wellbeing. In fact, The Gallup Organization identified that having a best friend at work was one of the key predictors of overall employee engagement. Do you have at least one person at work that you can talk to, share experiences with, and confide in? Raise a second finger if you do. The third ingredient of positivity at work is meaning or purpose. To what degree is your work—and the work of your organization—contributing to something bigger than just making money? We all need to serve something bigger than ourselves. If you have a clear sense of the bigger picture and how you contribute to it, raise a third finger. The fourth element of positivity at work is positive accomplishment or achievement. Are you good at what you do? Do you feel like you are learning and growing? Positive accomplishment fulfills a vital psychological need. Raise a fourth finger if you are learning, growing, and achieving at work. As the old saying goes, “If you have your health, you have everything.” How is your work environment contributing to your overall physical health? Sedentary, repetitive, and stressful environments take their toll. How would you rate your work environment’s impact on your health? If it’s positive, raise a fifth finger. An open hand—or a closed, little fist? Now take a look at your hand. Is it open with all five fingers extended? Or is it closed in a tight little fist? (See my personal score—and share yours—in the comment section below.) If you’re like me, it’s probably somewhere in between. A couple of areas are good while a couple of areas could use work. Now, the important question—what to do about it? For some great suggestions on how to bring some additional joy, optimism, and well-being back into your workplace, check out Edmonds’ and Zigarmi’s website, Positivity Works. You’ll find a free downloadable excerpt of their book that will give you actionable ideas you can use immediately. You’ll be surprised at some of the small things you can do today that will make a big difference. March 1, 2012 in Corporate Culture, Employee Engagement, Employee Work Passion, Growth, Relationships, Wellbeing. Okay–here’s how I scored myself in these five areas. Positive Emotion at Work–not as good as I thought but still two out of ten of these emotions at work in the past seven days–I’ll be checking out that section in Chris and Lisa’s book. Positive Relationships at Work–yes, I’m good on this. I have a couple of people at work I would consider good friends. Meaning and Purpose at Work–very good on this also–I believe in the work of our company and I have a clear sense of how my work fits in. Positive Accomplishment at Work–I feel good in this area also–I’ve been achieving goals and I have a clear path of growth ahead of me. Positive Health at Work–I have to work on this. Let’s just say I haven’t made as much progress toward my New Year’s resolutions as I hoped to at this point. Maybe I should check into that new workout room here on campus that just opened? Well, that’s my scoring–how about you?